The hardening of attitudes in our political culture has reached our Catholic hospitals. Relationships between the hospitals and the increasingly hardline US bishops have become so explosive in recent months they're making national news. In December the staff of Saint Joseph’s Hospital and Medical Center in Phoenix saw a dispute with their bishop escalate to the point where they were ultimately stripped of their affiliation. "Saint Joseph's Hospital and Medical Center in Phoenix can no longer identify itself as Catholic," Bishop Thomas J. Olmsted announced during a news conference in Phoenix on December 21, just in time for Christmas. The hospital was stripped of it's affiliation because it had conducted an abortion to save a mother’s life. The 27 year old woman would have died otherwise, the hospital said. But the retribution for their fateful decision was as swift as it was unbending. Bishop Olmsted first excommunicated a nun, Sister Margaret McBride, who served on the hospitals ethics committee. Olmstead's shocking move was seen as an attempt to intimidate the hospital from ever making a similar judgement. But of course it failed. So that led Bishop Olmsted to press the nuclear button: in effect he has excommunicated the entire hospital - because they dared to make a wrenchingly difficult decision that the rest of us can only hope we never have to confront. But two distinct things are happening here. Bishop Olmstead is protecting the Church's doctrine; Sister McBride is protecting the patients life. Should theologians be making medical decisions? Should faith interrogate science? Is the doctrine of the Church worth more than the life of an individual? Those are significant schisms that have opened up; they have been everywhere in Catholicism for decades now. It's past time we confronted them. You might think, given its recent history, that the conservative forces within the Church would have learned by now that the impulse to protect Church doctrine and the Church itself from scandal can quickly backfire (but you'd be quite wrong about that). It's not hard to see why. Shining moral absolutes are very hard to give up. Shining moral absolutes stand firm and unbending against the tide of history and the general murkiness of life. They clarify, they stand for something, and they stand against something. In that sense they're just like the Catholic Church itself. Moral absolutes create a world of black and white. Just like words on a page, just like the words in the bible, they spell things out for you, they give you a framework, and you can learn to overlook their shortcomings, and in fact you'll have to. Because in a world of color, which is where we all live after all, they can quickly run aground. So the clash we're witnessing is between a conservative mindset that values rules, dogma, sanctity and moral absolutes - and a much more compassionate outlook that refrains from quick judgment and takes the sometimes brutal contradictions of life into careful consideration. At the moment it looks like there can only be one solution: every Catholic hospital in the United States will lose it's affiliation. It's the only way to protect unbending doctrine from the decisions sometimes taken in American hospitals. Federal laws protect a patient’s right to receive emergency care, including terminations where they are warranted, and Catholic hospitals cannot invoke their religious status if it jeopardizes the lives of pregnant women. The need to adhere to religious doctrine does not give health providers cover or license to risk someone's life. So since the rules of this conflict have already been written, there can be no ultimate winner. To protect the Church the bishops must double down, and it looks like they intend to. They will do what they think is best: stand firm and unbending against the tide of history and the general murkiness of life. But standing on principal can also be a cop out. It can simply mean you haven't bothered getting your hands dirty. You can survey all the sin and suffering in the world, and heave a big sigh, and you can retreat to your ivory tower. In protecting Christ's message you can forget his example. 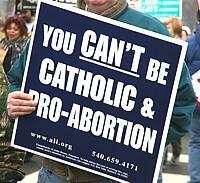 That's dissonance is exactly what so many former Catholics mean when the say the Church left me, I didn't leave it. In this world it's much easier to be a saint than a sinner, after all. The rule book is mercifully short. You just have to say no and keep saying no. No to complexity, no to the drunkenness of things being various, no to other people's suffering, and ironically enough, no to life.